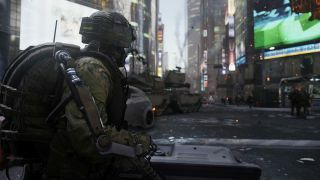 The Call of Duty: Advanced Warfare marketing campaign has emphatically kicked into gear, with the latest video talking up the game's narrative. Narrated by Sledgehammer Games Creative Director Brett Robbins, the team takes the opportunity to talk up the authenticity of the forthcoming installment, which is the first for Sledgehammer. According to Robbins, the studio consulted military advisors, Delta Force operators, Navy Seals and futurists in order to ensure everything from the story to the guns feels authentic (Insofar as a 'fun' 'game' can be as 'authentic' as an actual war, which is reportedly not fun). Advanced Warfare will focus on a single protagonist this time around, and will feature “fully rendered character animations” for the first time in the Call of Duty series, meaning when you see Kevin Spacey on screen, it will look even more like Kevin Spacey than it could ever have before. Set for a November 4 release, Advance Warfare had a big showing at E3 last week. A bunch of new footage was released, and we got a hands-off glimpse at a couple of the campaign missions. According to Evan Lahti, Advanced Warfare " doesn't seem to be breaking Call of Duty's campaign template ," despite the laser guns and jetpacks.